While Halloween has always been one of my favorite holidays, I rarely dress up. I’ve been averse to putting a lot of time and resources into something that won’t get worn very often, and I hate to wear a half-hearted costume. Lately, though, my attitude towards sewing is shifting away from everyday basics, which I can find secondhand, and more towards the grand visions, and this year, for the first time since I was 12, I sewed my Halloween costume from scratch. 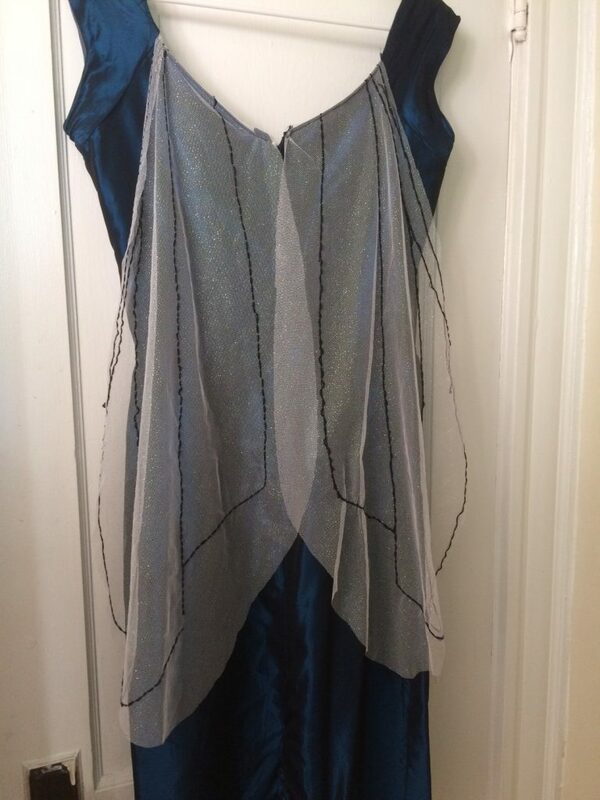 I had the idea a couple of Halloweens ago for a glamorous, cocktail-dress-wearing fly. It rattled around in my head for about two years, and when I realized it wasn’t going away, I decided to make it happen. I am pretty sure the idea originally sprouted from the thought of arranging my hair into some sort of fly-eye bouffant, but I’ve had a haircut or three since then, and I’m not sure I would have been able to make it work even if my hair was still long. So I was going to have to make my own headpiece. 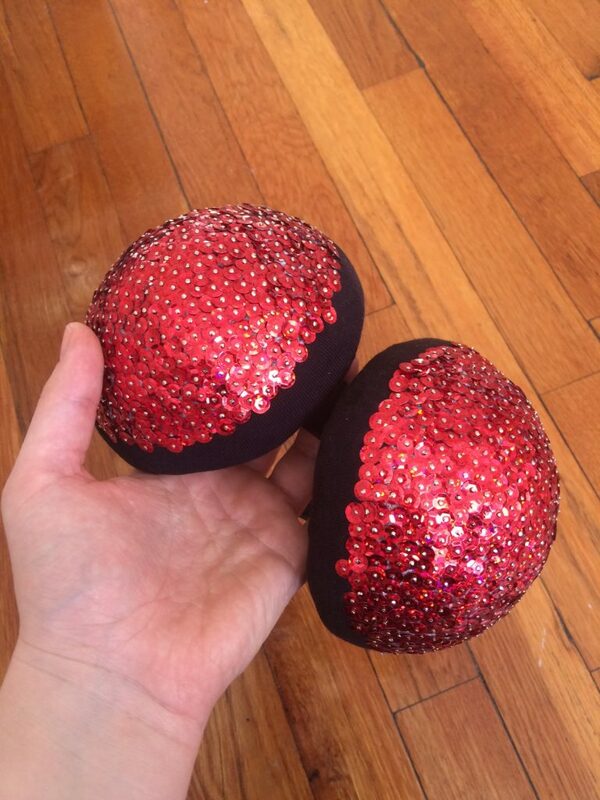 I toyed with the idea of a single round fascinator with sequins and feathers, but gave it up as too abstract and settled on actual eyes, which I created by sticking over a thousand individual red sequins onto a halved styrofoam ball with pins. This was a tedious task that took many, many episodes of Battlestar Galactica to complete, and I had to stop partway through to order more sequins and pins. When the two halves were done, I hot-glued them onto a cheap headband, after which they promptly fell off during my first party and I had to re-glue them even more firmly before Halloween itself. The wings are made of sheer, sparkly netting cut off of a child’s costume from Goodwill, with black embroidery to suggest a wing pattern, and basted onto the back of the dress. Initially I had intended on making, and in fact did make, wings out of wire and cellophane based on online tutorials. After wrestlings with spray adhesive and multiple layers of cellophane on a breezy day, the wings turned out to be less snappy and more cumbersome than I had hoped, and so I came up with the fabric ones instead. I still have the wire ones and I daresay they will be suitable for a different costume someday, so it’s not a complete loss, or perhaps I’m just in denial. Crucial to my vision was a blue/green iridescent wiggle dress, the color of one of those big blue/green flies. I didn’t want to spring for nice fabric since it’s expensive, but I didn’t want to spend actual money on polyester taffeta, so I searched the thrift stores for old prom dresses, which frequently come in this exact color, and lo and behold, I found what I was looking for for a mere three dollars. Turns out though, this fabric is cheap and old, which makes for a dress which doesn’t have much more than two wears in it before the seams start to give way. The pattern is Butterick 5814, a Patterns by Gertie wiggle dress with a boned bodice and many, many pleats. Not a dress to attempt to sew in only a day in between work and trapeze class, but after I was invited to a party four days before my original costume deadline, that’s what I did… and somehow, miraculously, did complete it, down to ripping out the bones on the bus to class after they were found to poke me in the waist and provide no support to the bust whatsoever. Seeing as I had a limited amount of time, I didn’t spend much of it diagnosing the fit issues and so I’ll have to start over from scratch if I make this dress again. And I really do like the dress! Obviously wiggly cocktail dresses are not a huge staple of my wardrobe, but next time I need one I may very well turn to this pattern. 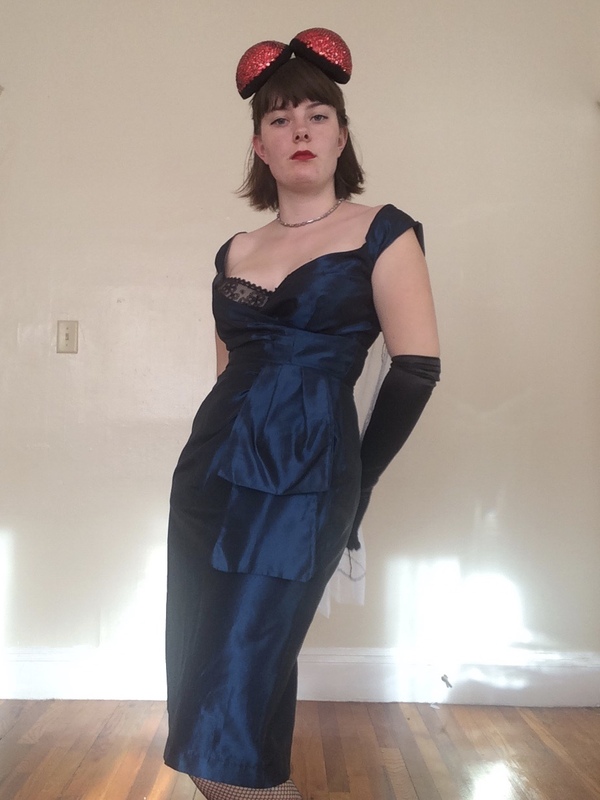 I had imagined that this dress would do double duty as costume dress and cocktail dress, but between the comically low neckline and the lack of seam finishes on the inside, I think it will remain specific to this costume until it falls apart. In general I feel that this costume is sloppy and I can think of a million things that I would like to re-do, or wish I had done differently, to the point where I would practically have to start over from scratch to get it where I want it. But! I am still really really pleased and proud and excited by it, because it feels like such an accomplishment to have gotten a costume out of my head and onto my body, and because I had to do things that were out of my comfort zone–like wire wings and headpieces–and muddle through somehow. It’s nice to have a costume in my wardrobe, you know, just in case I get invited to a last minute costume party. And I feel inspired to try more things just for fun, instead of feeling like all my projects should serve a purpose. It feels creative, and even if it’s silly and sloppy, it feels kind of like art. This entry was posted in art, costume, sewing on December 7, 2017 by Alice.